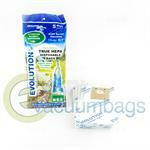 Evolution vacuum bags offer Micro filtration, some of them HEPA level filtration. These high levels of filtration help allergy sufferers, removing more microscopic particles from the environment. Your Evolution vacuum also lasts longer and runs cooler, as fewer particles pass through the motor. Evolution Micro-filtration bags filter particles as small as 5.0 with 99.7% efficiency, and also capture particles down to 0.1 microns. Evolution’s HEPA filter bags provide even more peace of mind for those concerned with allergens in the home. Providing HEPA H13 level filtration, they offer 99.95 total retention of microscopic particles. Evolution paper bags offer a sealable closure collar, to provide for more hygienic bag change and disposal. Micro Filtration Upright Paper Vacuum Bags for Evolution Lite DCC-658 Model Vacuum Cleaners. 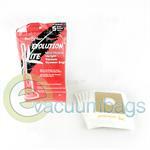 Genuine Evolution Style U HEPA Paper Vacuum Bags for Bernina / Evolution Upright 6000 Series Vacuum Cleaners.